Every time I go for dim sum I hope the trolley offers salt and pepper squid. Golden and crunchy, spiky and salty I could probably devour a basket all on my own. The other day I found the same dish on local Vietnamese restaurant's menu. I ordered it and, yes, it was pretty much the same dish as wheels by me, nestled betwixt and between steamers of siu mai and har gao. This got me wondering of the dish's provenance and if it was simply by a happenstance of abundant regional coastlines or if it was manufactured to appeal to Western palates. The similarities, down to the sautéed chilli garlic was simply...uncanny. Authenticity of salt and pepper squid is neither here nor there. I set out to replicate the dish and I think I did a fairly good job of it. I think, at its heart, it is a non-recipe recipe: squid rings and tentacles dusted in a peppered flour and cornflour mixture, deep fried for a couple of minutes and then tossed in lightly sauteed in a sweet and slightly sour mix of garlic and chillies. I suppose using Thai sweet garlic chilli sauce may put a few noses out of joint, but really all that means is more for the rest of us. Toast Sichuan peppercorn in a skillet until their fragrant oils have released. Let cool for a minute or two and then crush or pound lightly. Mix together wheat and corn flours with the crushed Sichuan pepper. Set aside. Heat a few inches of oil in a high-sided pot until it shimmers and an inserted wooden skewer (or wooden spoon handle) bubbles when inserted. While the oil heats, dredge the squid pieces in the spiced flour mixture and set aside. When the oil is ready, fry the squid in batches, for about two minutes. The rings will not take on much colour, but perhaps a few golden speckles. Remove to drain on paper towels, hitting each batch with a pinch of salt while still hot with oil. 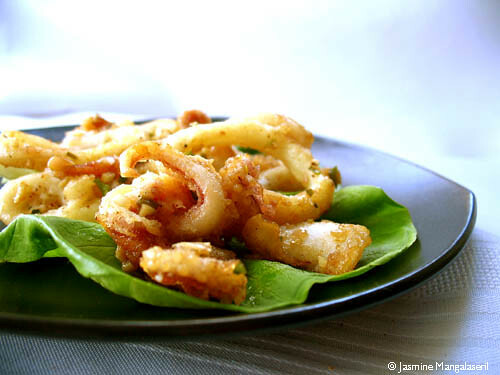 Continue frying the squid, ensuring the oil's temperature is maintained, and adding more, if necessary. When all the squid is cooked, put a frypan on a medium flame and add a spoon or two of the frying oil. Add the shallot, garlic and chilli and saute for about a minute, or until the garlic has scented the air and the shallots begin to wilt. Add the vinegar and chilli sauce and stir well. Tip in the fried squid and coat. Test a piece and balance flavours to taste. - If you don't have Sichuan pepper, you can use black pepper or chilli pepper, but change the quantities to suit your spice tolerance; you won't need to toast black or chilli pepper. - You can use red or white wine vinegar with a bit of soy sauce or Worcestershire sauce instead of black vinegar. The flavour will be different, but still perfectly good. - This recipe is easily doubled, if you want. With Chinese New Year looming fast I am always seeking tasty recipes to bring to the table. That is my utmost favourite in Chinese restaurants... I have been known to refuse to go to one or another if it's not on the menu. Wherever we travel I always try and order it...and it has been delicious in Honlulu and Kuaui in Hawaii, Perth, Sydney, Brisbane and Hobart in Australia, Buenos Aires and most places in the UK. 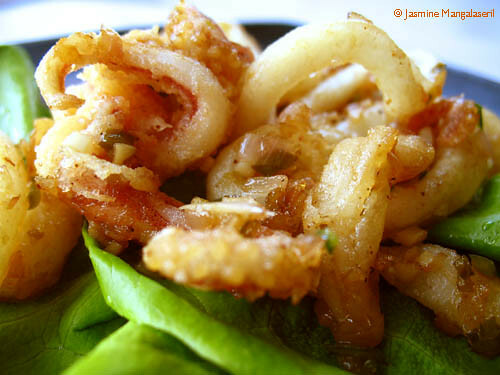 You can't go wrong with salt and pepper squid. I'm going to make it your way this weekend! Thanks Jasmine! I just adore salt and pepper squid. One of the best I have had is in the David Jones Oyster Bar in Elizabeth St, Sydney - soooo good. Thanks for the lovely comments, all!